The world of dual cab utes has undergone a massive transformation over the last 5 years, starting with the revolution on 2011 2012 with the introduction of the Isuzu D Max, Holden Colorado, Mazda BT 50 and Ford Ranger. The dual cab Utes on the market today, especially the top of the range models, are a far cry to the farm Ute I grew up with. These days they are the Swiss army knife of the motoring world. They are utilised as a work Ute during the week, a towing vehicle, a family run-around and an off road truck or touring vehicle as well. I thought I would do an article comparing three of the best dual cab Ute on the market today. 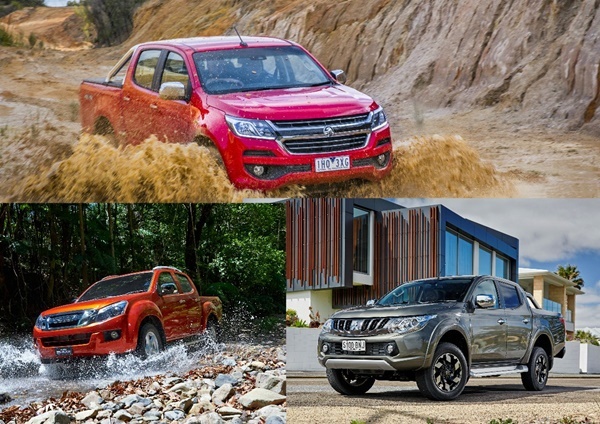 The recently released Euro 5 compliant Isuzu D Max update, the multiple award winning Mitsubishi Triton Exceed and the surprisingly sophisticated Holden Colorado LTZ. The Mitsubishi will bring in the majority of its torque at 1500 rpm and again another boost at 1750 rpm then maximum torque at 2500 rpm.The figures tell one story, the actual real life experience is often different. For example the Isuzu will deliver 380Nm of torque (previous maximum) 1,700 – 3,500 rpm – which is 100 rpm lower and continues 700 rpm higher – meaning the same engine rpm provides more power and the same torque can be generated at lower engine rpm. The Colorado has long had the headline figures but until the latest release didn’t deliver what was expected. Now with new mapping of the transmission matched to the engine torque characteristics, the Colorado delivers a minimum of 425 Nm of torque between 1800 rpm and 3500 rpm. The Colorado takes the win for power and torque, the Mitsubishi for value for money and the Isuzu for real world fuel economy figures, especially when towing. These three double cab Utes are pretty much similar, with minor differences between them. The most noticeable thing is the differences in GCM of the vehicles and how this relates to towing capacity, payload and GVM. This is an interesting subject that most buyers have absolutely no idea about. Holden have an excellent payload calculator on their website and I encourage all readers to have a look at it to see what goes into making up the GCM of the vehicle. Remember if you exceed your vehicles GCM then not only are you operating a potentially unsafe vehicle, exceeding what the manufacturer states is safe, but you are also voiding your warranty and insurance. Payload Kg 924 945 ?? As mentioned before the new wave of dual cab Utes are more family oriented, especially the top models in the range as we have here. Buyers expect more comfort features, more safety, more car like appearance. All of these three Utes have an ANCAP 5 Star safety rating. The Colorado however overwhelmingly takes the points for its forward thinking with extra features over the other two. So here we have three of the best options for dual cab Ute buyers. You can make of the information what you will. The argument about which Ute is best depends on where in the product cycle the Ute is, what is important to you and how much money you have to spend. I hope you can use the information to assist you in your buying decision. In this comparison we have left out the Ford Ranger, Toyota Hilux and the Mazda BT 50 simply because we will be comparing them next times.